The highest judge in the Supreme Court was ousted on May 11, 2018 because of reasonable grounds found by the 8 justices who voted for removal of Lourdes Sereno. Yen Makabenta, a veteran journalist listed lies of Sereno that made her appointment void thru quo warranto. "CJ Sereno’s magistracy has been layered by multiple deceptions, each one calculated to achieve a particular objective," Makabenta said. The deception in August 2010, which purported to show that lawyer Maria Lourdes Sereno was qualified to be nominated and then appointed by President Benigno Aquino 3rd as his first appointee to the high court and as the youngest associate justice of the Supreme Court. She had not spent a single day of service as a judge in the Philippine bench, of which 15 years of experience is one of the enumerated constitutional qualifications for a member of the Supreme Court. She also did not submit the statements of assets, liabilities and net worth (SALN) for 10 years required by the Judicial and Bar Council (JBC). Despite the missing requirements, the JBC inserted her name in its short list, and Aquino appointed her in August 2010. Sereno’s appointment on August 24,2012 by president Benigno Aquino 3rd as the new Chief Justice of the Supreme Court to replace former Chief Justice Renato Corona, who was convicted in a corrupted Senate impeachment trial. For this appointment, Sereno again failed to submit the required SALNS for her nomination and appointment. But the JBC inexplicably included her in its short list of nominees for chief justice submitted to President Aquino. There is a confirmed story that the JBC did not include Sereno’s name at first in its short list, and Aquino expressed dissatisfaction with it. After some haggling between Malacañang and the JBC. the list was revised. Sereno got into the picture, and then voila, Aquino appointed Sereno as the new Chief Justice. 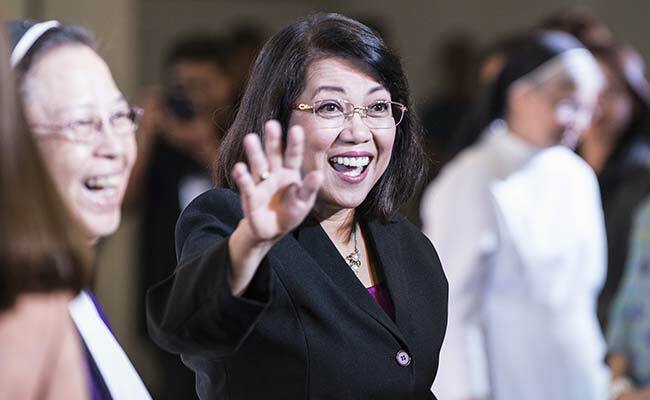 Sereno’s actions as chief justice to influence the court’s decisions on Hacienda Luisita, particularly on the subject of compensation for the land. She argued for raising the government’s compensation for the estate that was subject to agrarian reform. As for other services to Aquino in the high court and in the shaping of court decisions during his presidency, this can wait for another time. “Judicial independence” is another lie or misjudgment of her erratic magistracy. Magistracy is the stately word in the English language that denotes the office or authority of a judge or administrator of law. Playing the opposition is a deceptive maneuver by Sereno, perhaps the most deceptive of all. She means on the one hand to curry public favor by appearing to be resisting or fighting the encroachment by the legislative and the executive on the judiciary. She also seeks to court favor and exert some leadership in the ranks of the opposition by serving as a voice of opposition against President Duterte and his top leaders in Congress. She wants to play the role of victim, a familiar tactic of the yellow crowd, which desperately seeks a way to regroup and recover its footing. RJ Nieto aka. Thinking Pinoy shared a statement of Associate Justice Teresita Leonardo-de Castro regarding the padded resume submitted by Sereno. "In respondent's 2010 PDS and 2012 PDS, she indicated under Professional Experience that she held the position of "Deputy Commissioner" in the Commission on Human Rights (CHR) without specifying the period of her tenure," De Castro said. PDS refers to the Personal Data Sheet, a bio-data/resume of sorts that details a candidate's qualifications, including his/her professional experience. De Castro added: "During the oral arguments, respondent practically admitted that there was no actual position of 'Deputy Commissioner' in the CHR and it was merely her 'functional title' in the predecessor office of the CHR, the defunct Presidential Committee on Human Rights. Her explanation is absurd as functions cannot be attributed to a non-existent position in the CHR." In short, Atty. Sereno claimed in her de facto resume that she held a title that never existed. Thinking Pinoy shared another statement from De Castro stating that Sereno declared she was a lecturer at Murdoch University based in Australia. In actuality, however, respondent was a lecturer in Esteban School based in Taguig City. "Respondent (Sereno) further made spurious claims in her 2010 PDS and 2012 PDS when she declared that she was a lecturer at Murdoch University in 2001-2002 and at University of Western Australia (UWA) in 2003-2007, teaching International Business Law." "A reading of her entries in both PDS gives the impression that she was actually a faculty member at the said universities, which are based in Perth, Western Australia, Australia. In actuality, however, respondent was a lecturer at The Esteban School, now Australian International School, based in Taguig City, Metro Manila, Philippines. The Esteban School partnered with UWA and offered UWA's MBA program in the Philippines." "The deliberate omission of The Esteban School in respondent's 2010 PDS and 2012 PDS was just another audacious attempt to deceive, and respondent persisted in this lie when she refused to immediately acknowledge during the oral arguments that she taught at The Esteban School..."